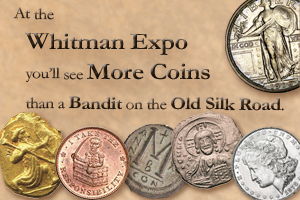 At the Whitman Coin & Collectibles Baltimore Expo, March 14-17, 2013, you’ll see more coins than a bandit on the old Silk Road. We’re talking U.S. coins, World coins, even ancient coins found along the Silk Road. Not to mention paper money, medals, tokens and other interesting and historic exonumia—all from more than 1,000 independent dealers. When the show gets underway you’ll find exactly that, and more. And here’s the really amazing thing: it’s absolutely FREE to attend. You can even take part in the official auction by Stack’s Bowers Galleries, including a special Rarities Night Auction that features a limited number of elite numismatic collectibles. Dealer setup will take place on Thursday, March 14 from 8 a.m. until noon. The Expo will open to the public at noon on Thursday and at 10 a.m. on Friday, Saturday and Sunday. Early Birds will be admitted at 10 a.m. on Thursday and 9 a.m. all other days. The Numismatic Guaranty Corporation is conducting its first Introduction to Grading class. The class instructor is NGC grader John Schuch II. NGC president Rick Montgomery will make a guest appearance. Advance registration is required for the class. For more information, call 1-800-642-2646. Join Karen M. Lee, a curator of the National Numismatic Collection housed at the National Museum of American History, at 1 p.m., Saturday, March 16. She’ll speak about The Private Sketchbook of George T. Morgan, revealing the man behind the coins, exploring Morgan’s never-before-published personal sketchbook, family photographs and documents. Immediately following the presentation, Lee will be available at the Whitman Publishing booth to autograph her book. Retired Bureau of Engraving and Printing plate printer Mike Bean will demonstrate the Spider printing press. A free limited edition intaglio printed souvenir card will be available by drawing. Each card will be numbered, dated, and signed by Mr. Bean. Stop by booth #1695 to see a demonstration and enter the drawing for one of the souvenir cards. The American Numismatic Association and several other organizations within the numismatic community will present educational talks and hold their club meetings. “Collecting Southern Gold Coins,” with Jeff Garrett and Bob Harwell, and “Introduction to Collecting Ancients,” with Mike Markowitz, are two examples of what to expect. Check the schedule for these educational programs and meetings. Fascinating numismatic items will be on display in the Maryland State Numismatic Association’s exhibit area. Last year’s competition, which crowned Simcha Kuritzky as the winner, showcased remarkable items. Kuritzky’s exhibit featured Engraved Coins of the Ba’al Shem Tov Amulet. Come by to see this year’s equally compelling field. Kid’s Korner, created exclusively for beginners and budding young numismatists, will operate on Friday and Saturday from 10 a.m. until 6 p.m. Every youngster aged 6 to 14 who attends will go home with free coins and prizes. Whitman is the leading producer of coin and collectibles expos in North America. For more information, or to register, visit Expo.Whitman.com. ← The Auction is Online and Bidding is Open!